Dr. Lenora Fitton (left) from ABC Pediatrics in Washington C.H. spoke at length in court about how the $250,000 embezzlement has affected her business, life, and the lives of others living and working in the community. From left to right, Dr. Fitton, Fayette County Prosecutor Jess Weade, defense attorney Gregg Slemmer, and Angela Johnson. No one claims to know what happened to the money Angela Johnson, 41, admitted to embezzling from ABC Pediatrics between 2012 and 2015 where she was working as office manager. According to court testimony Monday, it’s Fayette County’s largest known embezzlement case. A forensic accountant with the Bureau of Criminal Investigation identified more than $258,000 missing from the pediatrics office. Johnson’s husband said that he wasn’t involved in the embezzlement and didn’t know what his wife did with the money. Johnson’s attorney, Gregg D. Slemmer, said Johnson didn’t use the money to pay off her house. She didn’t buy a new car and she doesn’t drive a luxury vehicle. She doesn’t have a lavish lifestyle. So far, no one has been able to explain where the money went or where it may still be. If Johnson knows, she hasn’t said. Johnson, who most recently lived in Columbus, appeared in the Fayette County Court of Common Pleas Monday for sentencing on a charge of aggravated theft, a third-degree felony. After listening to the defense and prosecution’s mitigation testimony, Judge Steven Beathard ordered Johnson to spend the next two years in prison. Dr. Lenora Fitton manages ABC Pediatrics – it’s the only pediatrics office in Fayette County – and realized money was missing in 2015 after Johnson took an extended leave of absence from work. As office manager, Johnson had access to the business’s banking accounts, checkbooks and online accounts. Court documents show Johnson used the business accounts to make personal purchases to online markets and department stores, and wrote blank checks to herself and cashed them at Columbus-area banks. Some of the online purchases Johnson made with the business accounts included a pair of gold glitter shoes, a rabbit hutch, a “proud mom” t-shirt, collegiate jewelry, poker chips and poker game accessories, a bedding set, and dozens of other miscellaneous consumer items. The personal checks were written in increments of $400. Slemmer said it took them about a year’s time to go through the business account statements and identify each line item that had been purchases made by Johnson. Slemmer said in court Monday there was a lot more to the picture than just his client stealing money. Slemmer said Johnson’s psychological issues were to blame for the crime. Johnson’s husband said that he had noticed a progressive worsening of Johnson’s mental health over eight years leading up to the crime’s discovery. Johnson spoke during mitigation and turned to look at Dr. Fitton, who was present in the court room with approximately 40 other people who had come for the hearing and filled the courtroom seats. “I’m so sorry I hurt you. I want to get every dime back for you,” said Johnson. The hurt is still being felt. Dr. Fitton, addressing Judge Beathard, said that in addition to the lost $250,000, ABC Pediatrics had nearly been “crippled” and forced to close. The only thing that has saved the county’s only pediatrics office has been the doctor’s own will: she took out a loan for $48,000 to pay the salaries of her employees in 2015, reduced her own salary, and is now traveling across the region working to make up for the loss. In total Dr. Fitton said she has spent 195 days in the past two years working in other areas away from her family and business to make up for the loss. She is also facing a 2014 IRS tax bill for $145,000, with accrued penalty charges of more than $42,000, and has $80,000 in vendor bills that have been unpaid. Dr. Fitton said hundreds of children in the community are still being affected by the loss. When Dr. Fitton has to leave the county and travel for more work, the children at ABC Pediatrics are seen by her sole nurse practitioner, Ashley Berman. Dr. Fitton had one last remark in court Monday: “So I ask you, Angela Johnson…why did you do this to us!” To which Angela Johnson could not answer. Johnson was placed into custody of the court’s bailiff, Charlie Wise, and was conveyed to prison. In addition to her prison sentence, Johnson was ordered to re-pay the missing money to ABC Pediatrics. For now, the money will likely be docked from her commissary money in prison. https://www.recordherald.com/wp-content/uploads/sites/27/2017/08/web1_ABC1.jpgDr. Lenora Fitton (left) from ABC Pediatrics in Washington C.H. spoke at length in court about how the $250,000 embezzlement has affected her business, life, and the lives of others living and working in the community. 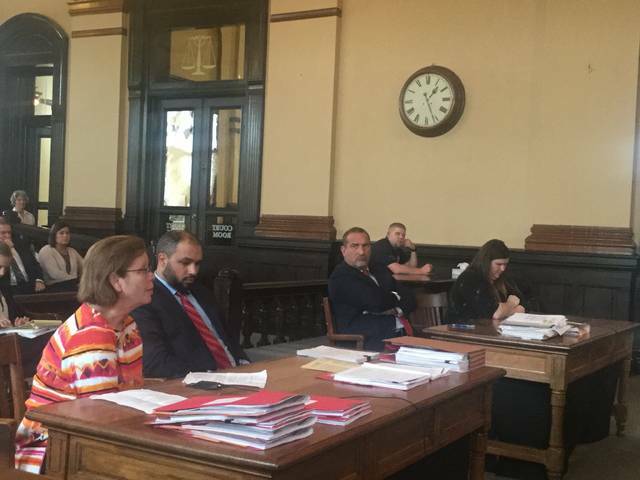 From left to right, Dr. Fitton, Fayette County Prosecutor Jess Weade, defense attorney Gregg Slemmer, and Angela Johnson.